A campus full of interesting buildings and beautiful gardens, the museum presents an eclectic collection of art and objects. “American folk art. French Impressionist paintings. Historic New England architecture. Duck decoys, circus animals, and dolls. 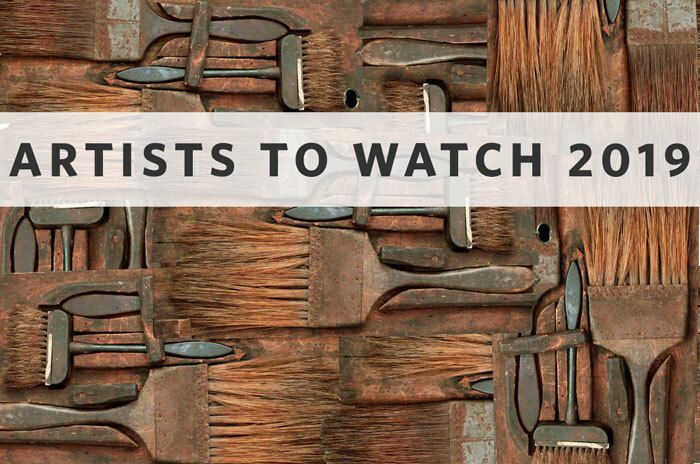 These were just some of the some of the interests of Shelburne Museum founder Electra Havemeyer Webb.” Expertly curated, temporary exhibitions at the The Pizzagalli Center for Art and Education make the museum a year-round destination. “Johnny Swing: Design Sense”, curated by Kory Rogers, is the first in a new series that explores the creative processes of innovative artists and designers working throughout New England today. Based in Brookline, Vermont, Johnny Swing is best known for his luxurious coin furniture and large-scale architectural lighting. The exhibition provides visitors with a fascinating glimpse into the various phases of the artist’s philosophy and practice, from the early conceptual stages of sketching and model making to fabricating molds and engineering the structural elements, culminating in sophisticated works that blur the lines between art and design. “Johnny Swing: Design Sense” pulls back the welding curtain to reveal this internationally renowned studio furniture maker’s creative process and experimental designs. Unlike a traditional museum exhibition, which treats preparatory sketches and models as adjuncts to finished works of art, this exhibition flips the script by venerating Swing’s arsenal of specialized tools, works in progress, never-before-seen prototypes, and lesser-known but equally impressive lighting designs. In another departure from standard exhibition practice, the entire show is narrated in Swing’s voice. Instead of traditional texts written by the curator, the texts accompanying the works on view will take the form of Swing leading visitors through his thought processes, in an attempt to approximate the informative and entertaining experience of a private studio tour. Johnny Swing in his Brookline, Vermont studio. Photography by Paul Specht. Dubbed “the Thoreau of the Adirondacks” by art historian and critic Helen Appleton Read (1887-1974), American modernist painter and social activist Harold Weston (1894-1972) was lauded during his lifetime by modernist artists, critics, and patrons. 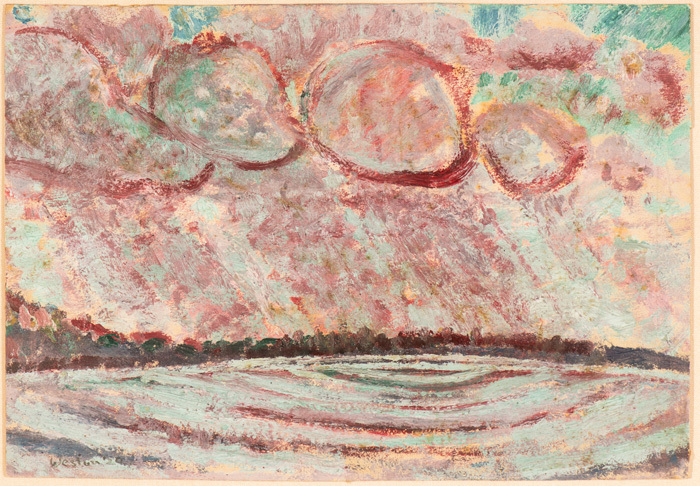 Drawing from extensive collections of the artist’s estate (the Harold Weston Foundation) as well as select public institutions and private lenders, this is the first museum exhibition to illuminate the links between the artist’s distinctive and lyrical written words with his prodigious body of work. Taking inspiration from Weston’s art as well as his philosophical views on nature, Harold Weston: Freedom in the Wilds presents the artist’s early Adirondack views (1920-1923) and selections from the Stone Series (1968-1972) alongside sketchbooks, diaries, letters, and related ephemera that make a case for the connections between the human spirit, nature, and Weston’s art. Writing in the preface to his book Freedom in the Wilds: An Artist in the Adirondacks (third edition 2008), Weston commented, “I have been a devotee of the dews of the wilderness since childhood, and do not pretend to be without strong prejudices on its behalf.” While Weston balanced art-making with a drive to advocate for humanitarian causes across the globe, it was his love of and close relationship with the Adirondack wilderness that defined much of his work. Hailing from Merion, Pennsylvania, Harold Weston summered in the high peaks of New York’s Adirondack region with his family as a boy. The region spoke to the young idealist, a sensitive artist with philosophical leanings. In 1920, Weston decided to make the mountains his year-round home, and with the assistance of a local carpenter built a one-room cabin in St. Huberts, New York. Adapted from the Museum’s press materials. Private Collection. © Harold Weston Foundation. Photography by Andy Duback. 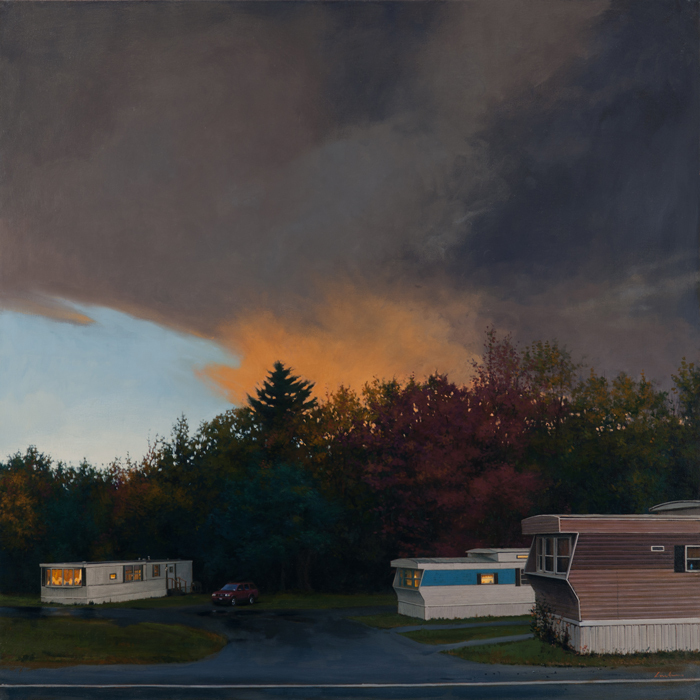 “New England Now” is Shelburne Museum’s inaugural exhibition in a curated biennial series featuring contemporary artists organized around thematic subject matters. “New England Now” challenges the notion of the Northeast’s long-accepted stereotype as stagnant and quaint, and instead plumbs its evolving identities and complex beauty. Building upon scholarship on the visual construction of the region, this exhibition explores the contemporary landscape, capturing the changing environment. From disintegrating historic buildings and disappearing “virgin” land, New England Now reveals our evolving landscape. 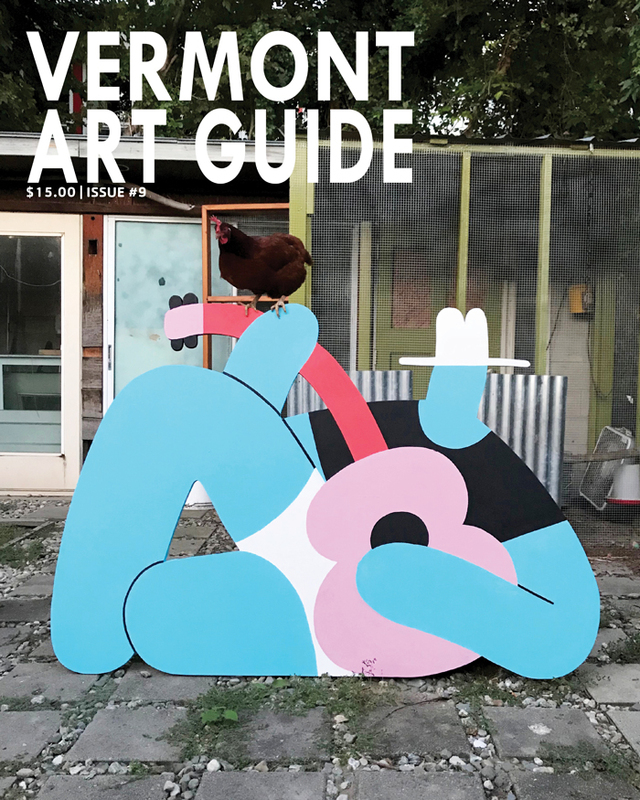 Vermont Art Guide Editor Ric Kasini Kadour wrote a review of “New England Now” in Vermont Art Guide #9. 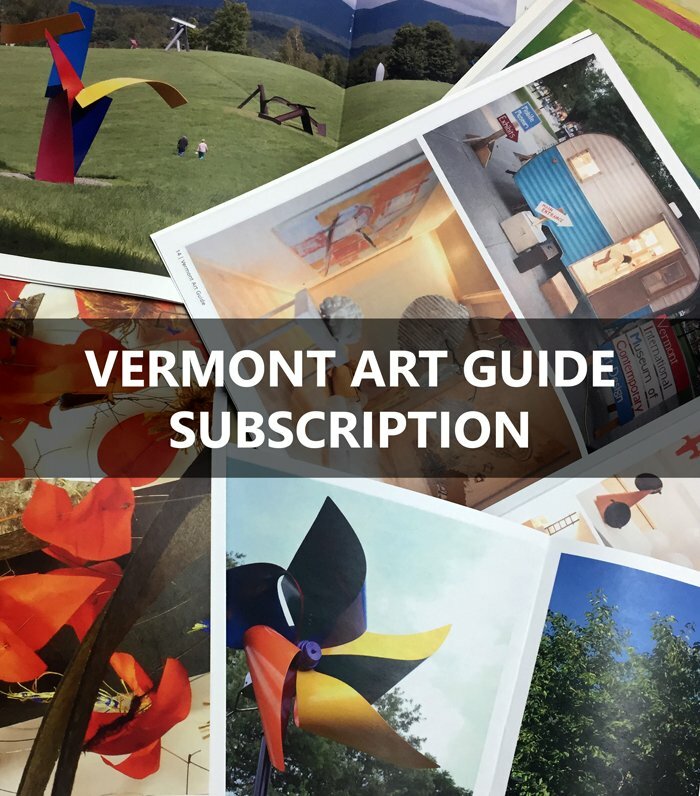 GET YOUR OWN COPY of Vermont Art Guide #9 or SUBSCRIBE. SNE 48010 by Peter Lyons (36″x60″; oil on canvas; 2015) Courtesy of the artist. 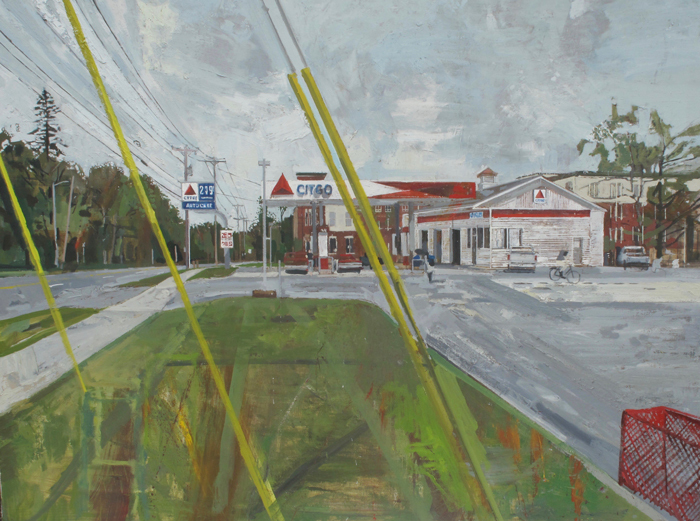 CITGO Rt. 7 by Peter Fried (34.5″x46″; oil on linen; 2018) Courtesy of the artist. Trio by Linden Frederick (40″x40″; oil on linen; 2010) ©Linden Frederick, Courtesy of Forum Gallery, New York, NY. The exhibition investigates the popular phenomenon of “perspective” or “bird’s eye” views that sprang up during the second half of the 19th century through more than three dozen drawn, painted, and printed views of the Green Mountain State. Often created by itinerant painters or roaming “Map Men”, these depictions presented orderly visions of growing towns and highlighted civic development, industry, and technological advancements. Mingling facts with a measure of imagination, these stunning panoramas were frequently displayed in homes and businesses and intended to boost commercial and investment interest while also stimulating civic pride. 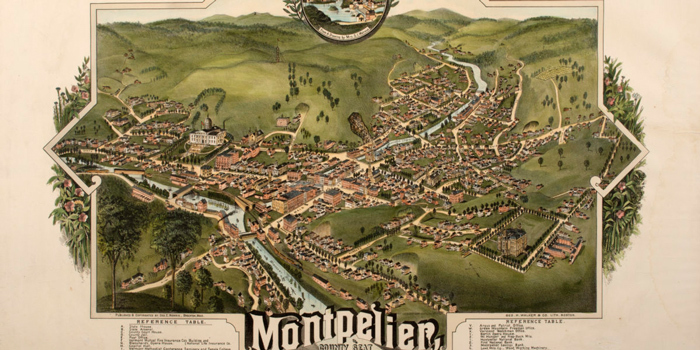 Featuring towns from Bennington and Burlington to Vergennes and Waterbury, “Mapping an Uneven Country” explores the creation, marketing, and consumption of 19th-century bird’s eye views and asks how these powerful images worked to shape perceptions of Vermont’s identity for a broad public. Considering themes like natural resources, commerce, and historic border relations, historic works will be installed alongside select works by contemporary cartographers, allowing exhibition visitors opportunities to explore and question the way(s) that we continue to make sense of Vermont’s evolving landscape. Aaron T Stephan likes to provoke and challenge visitors to reassess their perceptions of the world built around them. His sculptures investigate how recognizable symbols and materials shape our impressions of everyday objects. Using both a critical eye and a wry sense of humor, Stephan’s artworks comment on the complex webs of information and relationships carried by the material world around us. 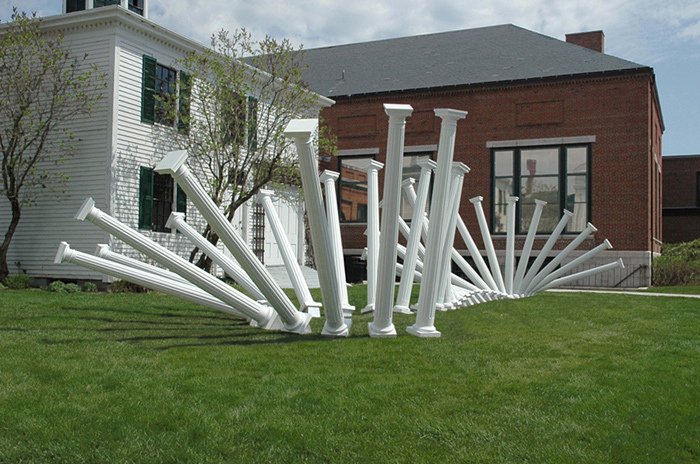 30 Columns is a spiraling cascade of classical Greek Doric columns that unravel and dance across the lawn at Shelburne Museum. These columns abandon their traditional vertical forms and structural functions, thereby calling attention to their autonomous agency, narrative, and beauty. Jean Lovell, a resident of Carmel, California and longtime friend of Shelburne Museum, has been collecting historic bedcovers since 1979. 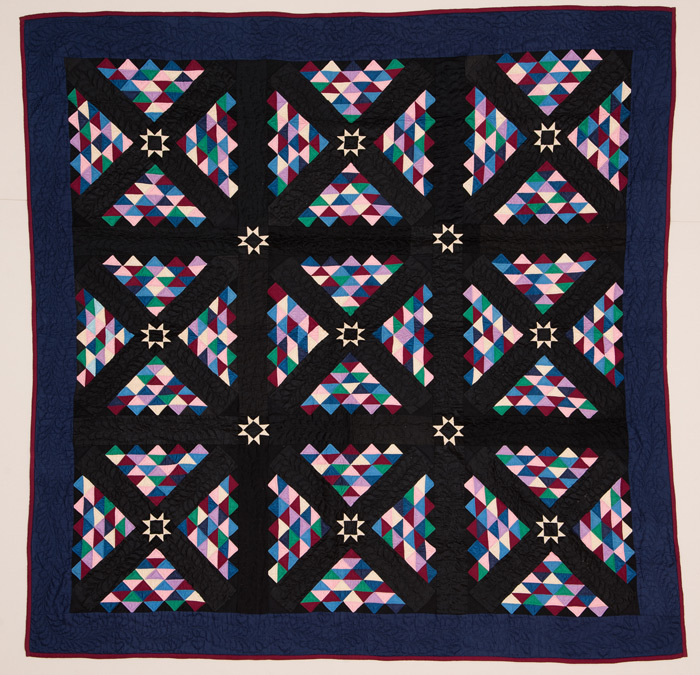 This exhibition features donations and loans from Lovell’s collection of historic quilts. Assembled over more than three decades from notable dealers like Joel and Kate Kopp (New York City), Phyllis Hader (Stonington, Connecticut), and Stella Rubin (Darnestown, Maryland), the collection is particularly rich in colorful, eye-catching designs. Highlights of the exhibition include Amish and Mennonite quilts from the 19th and 20th centuries ranging from a circa 1890 Double Irish Chain Quilt by Annie Laura Frankfort from Blainsport, Pennsylvania to a circa 1970 Amish A Thousand Pyramids Quilt from Holmes County, Ohio. “Wild Spaces, Open Seasons: Hunting and Fishing in American Art” is the first major exhibition to explore the visual culture of hunting and fishing in both painting and sculpture from the early 19th century to World War II. The aesthetically rich and culturally important works on view play an influential role in the history of American art. The exhibition encompasses a wide variety of portraits, landscapes, still lifes, and genre scenes, including iconic works by Thomas Eakins, Winslow Homer, and John Singer Sargent, as well as key pictures by specialist sporting artists such as Charles Deas, Alfred Jacob Miller, Carl Rungius, and Arthur Fitzwilliam Tait. In addition, it sheds new light on modernist interpretations of these subjects by George Bellows and Marsden Hartley, among others. American artists’ fascination with depicting hunting and fishing was often informed by their own experiences as practitioners and was more than merely a way of commemorating outdoor traditions. 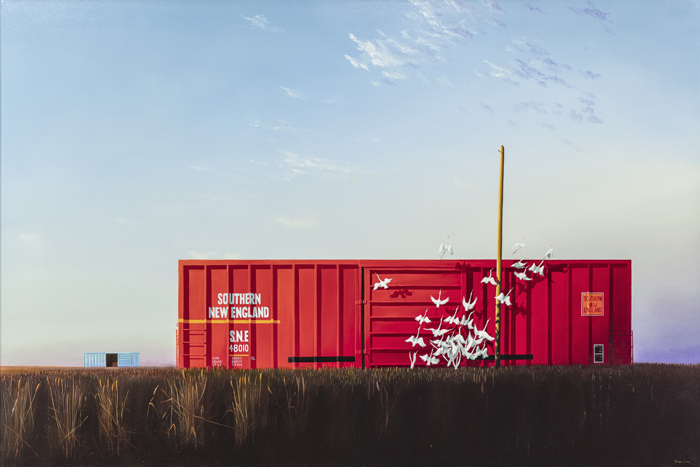 More than 70 paintings and sculptures illuminate changing ideas about place, national identity, community, wildlife, and the environment, offering compelling insights into socioeconomic issues and cultural concerns. While Ogden Minton Pleissner is recognized today for his hunting and fishing scenes, the artist once noted to his biographer that “I’ve done quite a few sporting pictures because I have always loved to fish and shoot, but I am not one that specializes in sporting subjects. Ten or 15 percent of my work is sporting–the rest is pure landscape painting.” The tension between evocative landscape and lively narrative is especially evident in Pleissner’s fishing pictures. 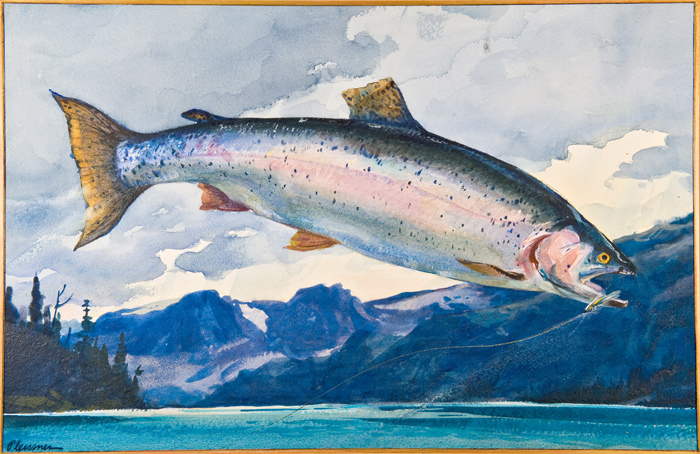 Drawn from Shelburne Museum’s permanent collection, the paintings, prints, and ephemera featured in “Upstream with Ogden Pleissner” transport viewers to some of the avid angler’s favorite streams, rivers, and lakes from Maine to Wyoming while also conveying Pleissner’s first-hand knowledge of and passion for the sport. Rock and Roll provided the soundtrack to American culture in the late 20th century. 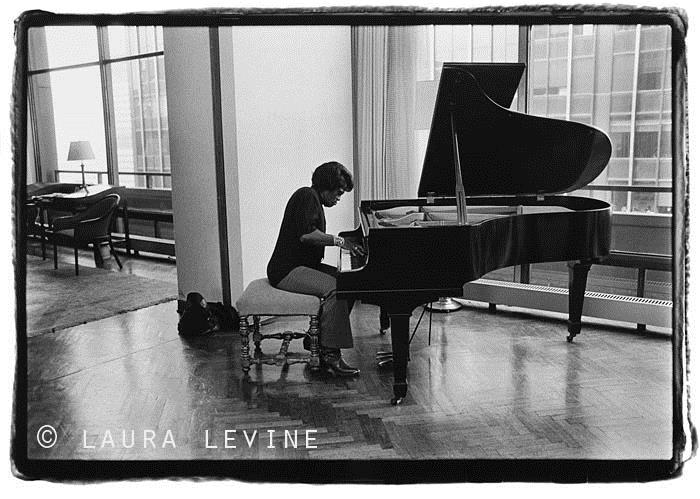 Drawn from one of the largest private collections of photographs of rock musicians in the United States, “Backstage Pass: Rock & Roll Photography” captures the intimate relationship between photographer and musician. Featuring more than 300 photographs, many rarely seen by the public, the exhibition includes studio portraits and candid outtakes of famous rock and roll stars and jazz greats from Miles Davis, Elvis and The Beatles to David Bowie, Prince, and The Beastie Boys. “John Bisbee: New Blooms” features new work by the inventive sculptor from Maine. 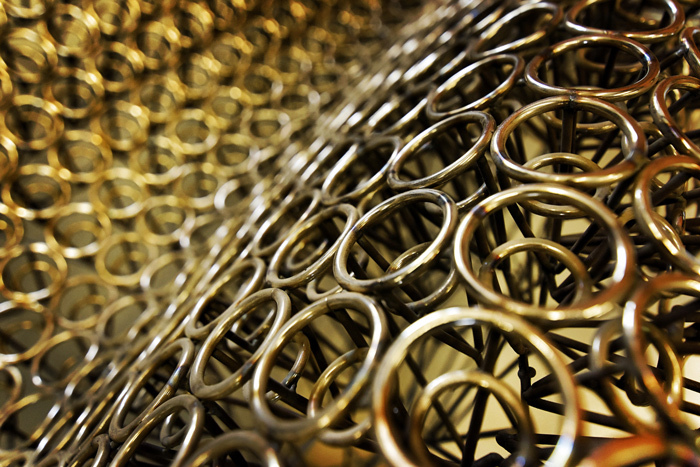 Bisbee’s works are created out of 12-inch bright common nails that are wrought individually and then welded together for the finished form. For “New Blooms” Bisbee has created several floral-inspired pieces that include Thicket, a densely tangled cluster of flowers–the stems made from elongated spikes and the blooms from the nail head. Each of the gallery’s walls is hung with monumental works, including Pelt, made with approximately 5,000 spikes placed at varied angles and spacing so as to evoke an animal’s coat. 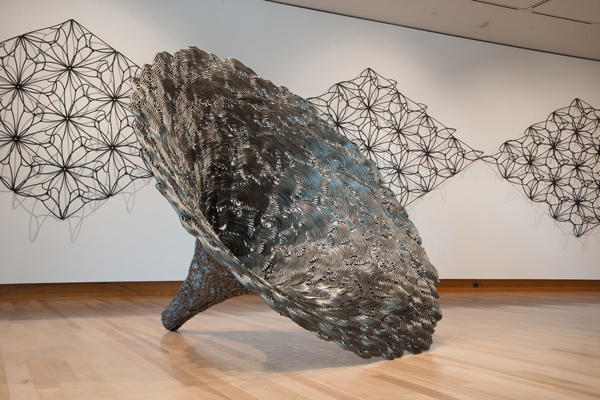 Hearsay is a large- scale, funnel-shaped piece in which the artist’s welding creates a brocade-like effect. John Bisbee, a sculptor in residence at Bowdoin College in Brunswick, Maine, has had solo exhibitions at the Albright-Knox Museum, the Kemper Museum of Contemporary Art and the Portland Museum of Art.